Storing wine glasses and other stemmed glassware can often be a bit of an issue if you’re limited on space. Why not use a wall or under your cupboards to store and keep your precious glassware. Using a wine glass hanging rack is not only a bit different; it’s practical and eye-catching too. The same can be said when you have little room to store your ever growing wine collection. 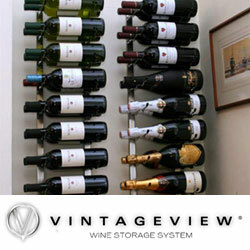 The VintageView Wine Racks allow you to store your wine directly onto the wall in a horizontal position (perfect)! You can easily read which wine it is as the label is easily identifiable. Wineware have wall wine glass racks and wall wine bottle / display racks available to purchase online. Traditionally glassware is stored within a cupboard or on the shelf, kept out of harm’s way so it’s can’t be knocked over and broken. Sometimes it’s only used for a special occasion or celebratory moment. However, if you’re limited on space and don’t really have a suitable place to keep your wine and champagne glasses (stemmed glassware) or don’t know how to store wine glasses, then using a glass hanging rack is a great idea! With the ability to store up to 24 glasses, simply let your glasses ‘hang’ from the rack. The base of the glass rests on the rack with the bowl and rim seemingly sits in mid-air, not only creating a safe environment to store your glasses, but it’s also visually brilliant! This is popular not only at home in the kitchen, but with bars and restaurants. With space being limited, using glass hanging racks also creates a great visual display, adding a bit of character to the bar area. 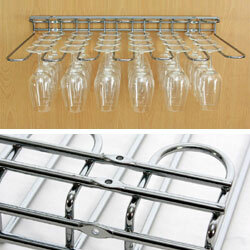 Glasses are easy to remove and add to within these racks, ideal for busy restaurants or bars. The Wineware glass hanging racks have 2 fixing points. You can either install the rack under a shelf / cupboard or on the ceiling, so you screw vertically or directly onto the wall, so you attach the rack horizontally. Alternatively, you can fix the glass storage rack using both points if you so wish, for extra stability. The VintageView wine racks are totally unique and ideal for bars and restaurants looking to create and eye catching display for the wines they’re serving. What better way to get your customers talking about the wine they’re going to drink to accompany their meal, than by creating a visual display ‘showing off’ what’s on offer. This modern wine racking system allows you to easily view your wine labels and showcase your wine collection. Traditionally, wine is stored within a rack where it’s hard to identify which bottle is which as you can only see the bottles top or cork! Therefore, it’s a quick and easy process to find the wine you’re looking for. The VintageView wine racking system is popular within the home as well as in the commercial sector with bars, pubs and restaurants. What better way than storing your collection, with a wall wine rack. Click here for more information regarding Wineware’s Wine Glass Hanging Rack and the VintageView Wall Mounted Wine Racks.